This statement starts nearly every discussion about safety in schools and affects how security professionals approach responding to school emergencies. The number one priority of law enforcement is to identify the threat and remove it  and only then tend to the wounded. As an architect who has focused her career on the design of school facilities, and as a parent of elementary-age children, these conversations are very intense for me. I spend my days thinking about how the school facility is the “third teacher” in the room, and that creating an inspiring, inviting and safe school can allow our kids to thrive in their educational environment. So, what does a safe school really look like? Do we have to make our schools look like jails in order to keep our kids safe? This is the discussion that recurs on soccer fields, at architectural design conferences and in school board meetings alike. In trying to respond to this question, one must begin by understanding what the threats to school safety are. I recently attended the National Domestic Preparedness Coalition’s seminar on school-based threat, risk and vulnerability. As I sat in a small theater surrounded by school resource officers, district administrative staff and school principals, all were desperately seeking “the formula”: If we only implement procedure Q or build our schools with features X, Y and Z, then our kids will be safe. And while I was seeking that formula, too, what I learned is that, like many things in life, no single solution exists that will anticipate every threat (natural or man-made). The safest environments are those that are surrounded by a strong community that knows who belongs where and supports their students and staff so they are proud to be part of that community, protecting it. Bellevue’s Tyee Middle School was built so play areas could be easily seen from the commons and school offices. Creating a facility that supports community requires the design of an inspiring and supportive place that encourages people to stay. This inviting atmosphere does not have to be at odds with safety. To create safer environments, we must begin by understanding our threats and recognizing that each district or school community will be different. Threats vary from tornadoes (similar to what happened in Joplin, Mo.) to student shooters at Columbine or known community members like in Sandy Hook, Conn., to the failure of critical infrastructure that can isolate a facility (like a bridge going down or a forest fire blocking roads). Anticipating threats requires gathering together a variety of stakeholders with different lenses: administrators, facility operational staff, planning professionals, emergency responders and community members. These groups must identify the range of problems that could occur and then develop plans for a series of scenarios that are clearly understood by each district. Getting together varying types of emergency responders is important in order to negotiate potentially conflicting strategies to unknown threats. For example, a fire alarm can be triggered by anyone walking past  either by someone alerting occupants to a fire, or by a sniper attempting to draw targets outside. Many incidents occur by those known to the community, those who know the school well, and are able to anticipate responses to threats. The Columbine perpetrators set a decoy bomb in a field to draw first responders, allowing them more time to cause harm within the school. Like a good football coach with an intricate playbook, administrative teams need to do in-depth analysis of potential scenarios and develop multiple approaches to address them, and then be prepared to implement them. Responding to potential threats in the design of schools begins with the integration of the principles of crime prevention through environmental design, which have long noted that the physical environment can positively influence human behavior through natural access control, natural surveillance, territoriality and maintenance. These principles continue to be the basis for safe school design, and are enhanced with geographic conditions that respond to natural conditions, such as tornado shelters, flood-management strategies and seismic requirements. Comprehensively assessing threats to our facilities involves integrating the input from multiple stakeholders. The goal is to have a uniform, comprehensive and holistic method of performing integrated threat, risk and vulnerability assessments that is readily available for operational use. • Is there only one way in and out? • Are trash and generator areas secured? • Can fuel lines be manipulated? • Are courtyards secured or inviting? • Do areas exist where someone can loiter unseen? • What distance from the building should parking be located in order to provide time for individuals to be identified prior to approaching the building? Within the building, creating a welcoming presence where everyone is greeted is important. Other strategies include incorporating vestibules that open directly into the office after the start of the school day and providing clear views from administrative areas to entry plazas. This allows for a clear understanding of who’s on site. Those intending harm at schools often break established patterns, such as looking for a loading dock that’s not secure or parking in staff parking lots. Establishing a secure yet welcoming school requires a careful balance between establishing a safe facility and fostering a creative learning environment. Many of the improvements require operational behavioral changes to anticipate potential threats. The school design can reinforce these safety practices while continuing to provide a quality learning environment. 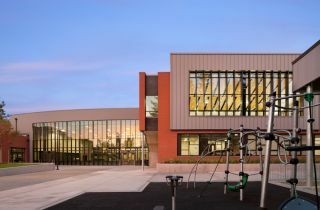 Rebecca Baibak is a principal at Integrus Architecture where she uses her nearly 20 years of architectural experience to lead K-12 projects throughout the Pacific Northwest.